Six months after his arrest, Heller is due back in court. A judge had allowed him to pursue "real estate deals" in NY, Washington, D.C., and Puerto Rico. 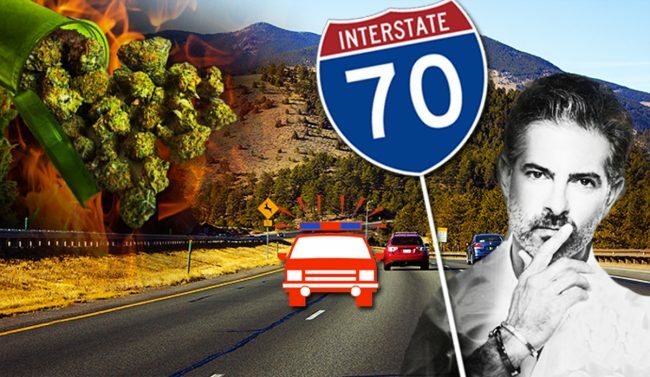 When a Colorado State Trooper pulled over Jonas Heller on Interstate 70 in late December, he suspected — or smelled — much more than a Los Angeles real estate guy on a road trip. Heller, a former broker at the Agency who had helped close deals for Ryan Seacrest and Nicolas Cage, was allegedly transporting 52 pounds of marijuana across state lines, traveling from California to his final destination in Denver. The two suitcases allegedly jam-packed with weed would have been enough to meet Colorado’s highest-tier for a marijuana-trafficking offense, making it a Level 1 Drug Felony. Six months and several postponements later, his court hearing is scheduled for July 10. Heller has yet to enter a plea. After the news broke of Heller’s arrest, the Agency quickly removed his profile from their website. Representatives for the Agency declined to comment on the exact day he was let go. But despite his dismissal from the brokerage, Heller filed a request shortly after his arrest to return to L.A. He cited “work on real estate deals,” according to court records. Heller was granted the request on Dec. 29 after posting $50,000 bail, and ordered back for a court appearance six days later. On Jan. 19, Heller’s lawyers asked the court to allow him to travel to New York, Washington D.C., and Puerto Rico. This time, his lawyers claimed Heller “will be unable to remain employed” in his work as a “real estate developer and business consultant for domestic companies” should he not be allowed to travel. It’s unclear what deals Heller was pursuing at the time. His lawyers, Fredric Winocur and Joshua Landy of Ridley, McGreevy & Winocur, declined to comment. A spokesperson from Mesa County Court said state prosecutors reviewed the travel request and found no objection. They granted his second request on the condition that he continues to submit to drug tests. Prior to joining the Agency, Heller worked at Westside Estate Agency. A cached version of his Agency broker web page noted that he split time between New York and L.A. and had completed over $1 billion in sales. Prior to the vehicle search, he allegedly admitted to having “just a little bit” of weed in the car. The state trooper then uncovered two large duffel bags in the trunk sealed tight with a Transportation Security Administration lock, authorities said. The trooper alleged the bags contained 52 pounds of marijuana in vacuum-sealed packages. Mesa County prosecutors charged Heller with possession with intent to manufacture or distribute marijuana, and improper usage of a passing lane.